On Friday, May 10, and Sunday, May 12, the Brooklyn College Opera Theatre with the Conservatory Orchestra will present a fully staged version of Giacomo Puccini's wry comic opera Gianni Schicchi. The Symphonic Choir, Conservatory Singers, and Glee Club, along with the Brooklyn College Wind Quintet and the Grace Chorale of Brooklyn, presented their annual John Hope Franklin Freedom Concert on Wednesday, February 27. The Conservatory's next auditions will be held May 17-22, 2019. Scholarships are available to outstanding performers with special awards for strings, woodwinds, brass, percussion, and collaborative pianists. Explore our professional studies graduate performance programs. Our M.Mus. 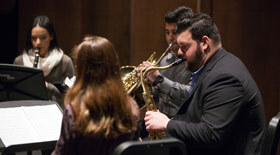 program in global and contemporary jazz studies is stretching boundaries. Discover our M.F.A.s in sonic arts and media scoring. In November 2017, in conjunction with the 31st Biannual International Electroacoustic Festival, the conservatory and the Center for Computer Music hosted a symposium, 'Legacies of Pauline Oliveros,' to honor the late composer's life, ideas, and music. Our next auditions will be held May 17-22, 2019. Click Undergraduate or Graduate for more information and to request an audition. Situated amid the vibrant cultural milieu that is Brooklyn, the Conservatory of Music of Brooklyn College offers undergraduate and graduate degrees in composition, music education, musicology, and performance, along with advanced certificate programs in music education and performance, a post-master's Advanced Diploma in Performance, M.F.A. programs in sonic arts and media scoring, and a new master of music in global jazz and contemporary music studies. Instrumental scholarships are available for outstanding performers: string, woodwind, brass, and percussion applicants along with collaborative pianists. Study with world-class faculty and receive professional training while being part of a great academic institution. Conservatory alumni are flourishing in their field, performing in orchestras, opera houses, night clubs, and cutting-edge concert venues, fostering arts organizations and festivals, and teaching in schools across the country and around the world. The conservatory is pleased to announce the opening of the new Leonard & Claire Tow Center for the Performing Arts, a state-of-the-art facility that promises to become one of the borough's premiere performance venues. Please explore the great music and theater that is going on in our spectacular new building. Ravel, Shéhérazade performed at all-Ravel concert, May 18, 2015. View our complete audio / video archive. The Conservatory’s next auditions will be held May 17-22, 2019. Help support our scholarships and programs. The Conservatory is a participating member of NYOA.